I was out in a prairie this morning (on crutches) and managed to get a little photography done. Very frequently, I think about how fortunate I am that most of my photography happens out of sight of the general public, and today was a particularly good example of that. I was army crawling along the ground with my splinted right foot in a plastic bag to protect it from the dewy grass, dragging a camera and tripod along with me. Then I had to crawl back to my crutches, sling my camera bag over my shoulder and crutch along to another spot. I managed to get a few decent photos, but missed a lot of potential insect shots because it takes me too dang long to get my body into place, and even the most patient insects can’t afford to wait for that slow and painful process. Later, while going through my photos back at home, I grabbed a plant key (“Flora of Nebraska”) to make sure I was correctly identifying the New Jersey Tea I’d photographed. There are two species in Nebraska, and I can never remember which is which. As I was reading through the descriptions of the two species, I laughed out loud at the technical terms I had to wade through. I understand the value of using precise language to describe plant (or animal) characteristics in a dichotomous key (a kind of flow chart used to step through characteristics of various species until you finally figure out which species you’re looking at). At the same time, the avalanche of technical language that falls upon readers of identification keys also makes identification of species much less accessible to the average enthusiast. I think I’ve correctly identified the New Jersey tea plant I photographed this morning as Ceanothus herbaceus, but it took a lot of glossary-searching to make my way through the descriptions. Gee, I wonder why people are so bad at identifying species? There has to be a better way. Again, I completely understand the need for technical guides for species identification that use agreed-upon and well-defined terms. But can we either add accompanying language in common English or create translated versions of those identification books that can be read by non-experts? If we can translate books of literature, can we also translate books of technical jargon? New Jersey tea in a southeast Nebraska prairie (Richardson County). I played around with this idea briefly, and it’s a lot harder than you might think. First, there’s the challenge of deciphering the individual words. The glossary at the back of The Flora of Nebraska is over 30 pages long, and reading it brings back memories of trying to read dictionary definitions back in elementary school – most definitions require looking up more terms just to understand the initial definition. Second, the advantage of technical terms is that they have very specific meaning, and that helps reduce the number of words needed to describe a concept. The Flora of Nebraska describes New Jersey tea flowers as being umbellate, which basically means the blossoms are located on the end of stems arranged like an upside-down umbrella. Umbellate is a pretty efficient way to say that. Instead of being able to describe how a species differs from others with a paragraph or two of text, accessible language might require a page or more to say the same thing. That causes its own problems. For example, in the above description of New Jersey tea, the seed capsules are described in seven words (“Capsules dehiscing loculicidally into 3 1-seeded lobes”). Very efficient. While the words are awfully cryptic to most of us, at least there aren’t very many of them! Translating those seven words requires a lot more words. Saying the seed capsules split into three parts, with a seed in each, isn’t too bad. The bigger challenge is the word “loculicidally” which describes where the split occurs on the capsule, a characteristic that helps separate New Jersey tea from other plants. The glossary describes loculicidal dehiscence as “dehiscence on the locules rather than along the septations”. Now we have to define both locules and septations. See what I mean? Good grief, this is difficult. Can you see how these seed capsules are dehiscing on the locules rather than along the septations? Yeah, I bet you can. I don’t have a good solution to this. One answer, of course, is field guides, and those can be great for animals like birds or large mammals. But field guides don’t work well for all organisms, especially plants, fungi, and many invertebrate groups because there are way too many species to fit them into a field guide, and distinguishing species from one another often requires magnification and characteristics that aren’t easily depicted in a single photo or drawing of the organism. Field guides can get us so far, but if we want people to learn how to identify more than just the common prairie plants, it would be great to have more extensive guides. I still think we could do a better job of making comprehensive species identification guides more accessible, but the task is gargantuan. It’s hard enough to put out a good resource like Flora of Nebraska, with precise and efficient terminology describing each species. If we ask authors of that kind of publication to additionally provide accessible translations of each description for lay people, we risk never get anything published at all. At the same time, I hear there are lots of youngish biologists with advanced degrees who are having a hard time finding gainful employment. Maybe we can put some of them to work as translators. Anyone want to fund a big endowment to pay for it? Yeah, me neither. Regardless, I really do think this is an important issue that deserves some thought. Not everyone can cheat the way I do, which is to shamelessly send photos and/or specimens to experts who can identify them for me, saving me hours of trying to look up and decipher words like “loculicidally”. P.S. I want to be clear that I am not criticizing The Flora of Nebraska or its authors in any way. That book is a fantastic and invaluable resource, and I use it frequently. The issue at hand is much broader than any individual publication. Robert, Dave, and Steve – you guys are heroes for getting that book done. Thank you. 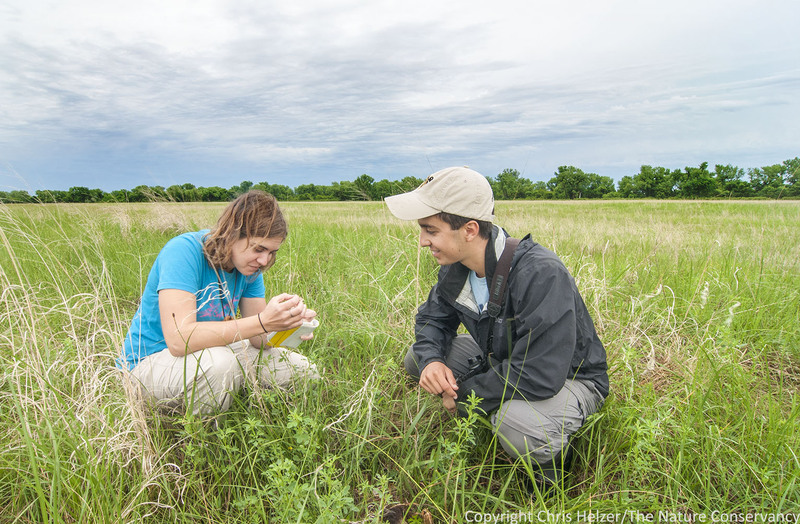 Kim Tri inspects a skunk skull in the prairie while Evan Barrientos looks on. The Nature Conservancy’s Platte River Prairies, Nebraska. This week, we began the third year of our Hubbard Fellowship program here in Nebraska. Evan Barrientos (Wisconsin) and Kim Tri (Minnesota) are both recent college graduates who will be spending the next year with us, learning all we can teach them about ecology, land restoration and stewardship, conservation strategy, fundraising, marketing/outreach and more. After a short orientation day on Monday, we spent Tuesday and Wednesday at a big conference with other employees of The Nature Conservancy. It was an uplifting, but somewhat overwhelming experience for Evan and Kim. While they learned a lot and met a lot of people at the conference, I was glad to get them back out on the prairie today so we could just take some time to wander the prairie together and talk about natural history and ecology. There are countless positive attributes of the Hubbard Fellowship program, but one of my personal favorites is the opportunity I get to interact with young, bright, and enthusiastic conservationists. I love seeing our work and sites through their eyes, and their questions and ideas challenge and inspire me every day. You’ll get the chance to hear much more about and from Kim and Evan in the coming year, and I hope you’ll feel some of the same hope and energy I do. We have a lot of conservation challenges to face in the coming years, but I think the next generation of conservation professionals is going to be equal to the task.